I think that is my error as the RD can only take a 32t max cog. Should I keep the Regina and find a different RD or should I find a max 32t freewheel (any suggestions). Or should I look at keeping the Regina and finding a different RD...perhaps in going modern if I can? Love some input from those who know! Last edited by hodgykins; 07-04-15 at 09:15 AM. 13-10 freewheel cluster? I think you have those numbers wrong, a 13 to 10 would offer almost no change in gears going from first to six, not even the old corn cob gears were like that, they were one tooth different from each other which means if you had such gearing it would be 13-18 or something like that. I believe Shimano 600 will handle up to 28 teeth and not 34, but someone can correct me if I'm wrong on that, I'm not sure about the 32, I think that's stretching it, again correction by someone else please, but if you know for sure it will take a 32 then use it. Optionally I would find a 7 speed freewheel with 1st being 28 or 32 if it works, 7 speeds will give you a slightly less drop between gears. 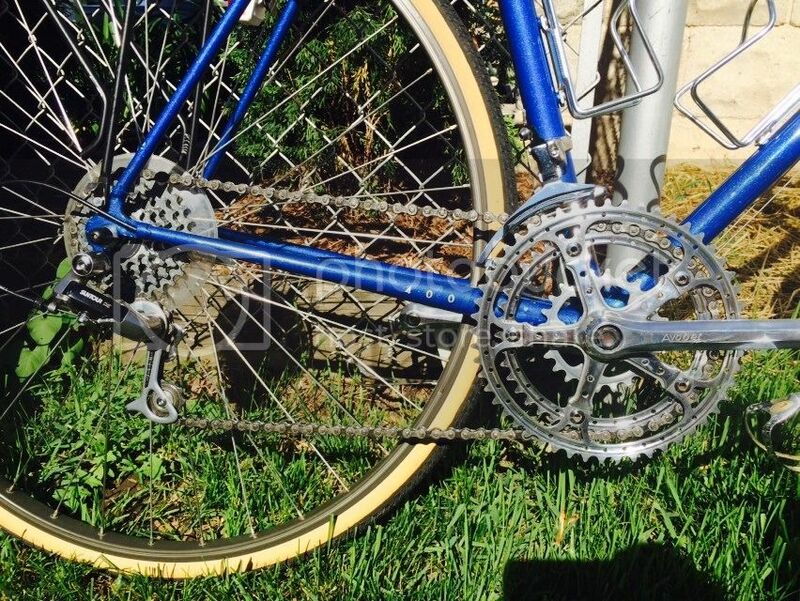 I would probably find a set of chainrings with more of hill climbing ratio which not knowing what you have now an LBS can help you determine that...if they know anything about vintage bikes. 28-30 seems super low aready to me. Lots of MTB came with a bit higher gearing. Since you already have the FW you might try looking for a 32t cog for it and just swap out the 34t. I am not sure if any modern RDs can handle a 34t but you may not be happy with the shifting if you have to go back to older rep slant parallelogram RD. Maybe an old Suntour Mtn Tech would work but you would have to check the specs on velo base. Thanks for the input...always appreciated. I've never had the chance to ride in 'Sconsin but have drive many miles of interstate there and didn't think the hills were that bad. I would imagine however that it is not so much steepness but the just long grinding grades? Check ebay for the 32t and maybe @PastorBobinNH will check and be able to tell just what cog you need. IIR different Reginas used different cogs in different positions. A Shimano Deore XT RD-M735 should handle 34T easy peasy, regardless of what the spec sheet on it says. I must be missing something here. Have you actually installed and tried running the (very slightly) bigger freewheel? Last edited by Lascauxcaveman; 07-04-15 at 11:40 AM. "Sconsin"...love that. It is not the interstate that is bad it is the country roads in "Driftless Area" Starting around Blue Mounds. The Dairlyland Dare is around the same area in an around Dodgeville. Read about both...you may change your mind and what the hell join us in our pain. There is another thread all about the Dare. I thought that as well. But I have the top cog riding against the 34t with the "b" tension bolt all the way in. A Shimano Deore XT RD-M735 should handle 34T easy peasy, regardless of what the spec sheet on it says. I've had a 34 working on an XC Comp, easily. Judging from what I've used on my M735 RD- there should be no problem- just tighten up the B screw. Magic should happen. Weird. Is your chain a little too long? If you don't mind tinkering with it, removing a link pair will stretch out the RD just a little more and budge that top cog down a skosh. This is assuming you don't care to have practical use of the one or two largest cogs in back while running the big chain ring. Last edited by Lascauxcaveman; 07-04-15 at 12:40 PM. I'll second the 'caveman's suggestion to remove two links in the chain first. The Deore should be able to handle the 34T. With that said, finding a 32T cog for your Shimano 600 freewheel should be your next step. I could have a 32T. I'd need to check. I've been going in the opposite direction with my '83 Paramount. Recently I swapped the clincher wheelset with a 7 speed (13-32) Sachs freewheel for a tubular wheelset. Unfortunately the tubular rear wheel is spaced differently and the 7 speed would not fit without the smallest sprocket rubbing the stays. The closest freewheel at hand and available was a Sunrace 14-28, so on it went. I did miss the extra 4 teeth on a few climbs. I guess the nice thing is that that granny bailout makes a 28/28- and that's pretty low. Of course not as low as something like a 26/30. I just yesterday put that on my Trek 400 with the Avocet triple crankset. Last edited by The Golden Boy; 07-05-15 at 11:06 AM. Update: What you suggested worked well. I have to give up the 34 on the big chain ring...but who cares. All good with B tension bolt all the way in.